This hand blown American-made opal glass student shade is decorated with hand painted Apple Blossom flowers. The shade has opal white and rose tinting. The overall floral pattern of this Student shade would suit many different rooms and decor styles. This student lamp shade's 10" fitter is the common size for most non-electric table lamps, such as Aladdin Lamps, Rayo, Miller, and many others. 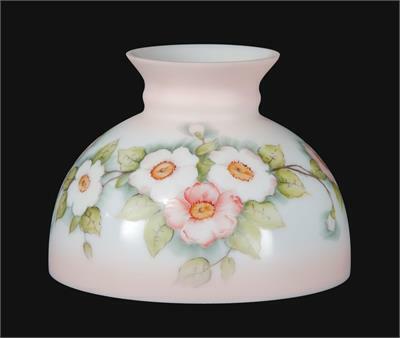 Will fit any table lamp or antique hanging lamp with a 10" shade ring or shade support. The Shade measures 7" high.